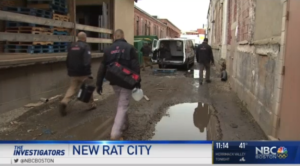 Check Out Boston Exterminators On NBC Boston! Catch Us On NBC Boston! Boston is the second most rat-infested city in America behind Philadelphia, according to federal census data. And that’s unlikely to change anytime soon. Boston is the second most rat-infested city in America behind Philadelphia, according to federal census data. And that’s unlikely to change anytime soon. Rats need three things to survive — water, food and shelter. Boston, built on a landfill, has plenty of all three. In the early hours of the morning, city inspectors stalk back alleys and trash bins in an effort to neutralize the growing rat population. Following trails of rat droppings, the inspectors set traps and plunge bricks of poison into the sewers to kill as many rodents as possible. The hardest hit area is Dorchester — the city’s largest neighborhood — followed by student-saturated Allston/Brighton, Jamaica Plain and restaurant-heavy Back Bay. One newer hot spot is Public Alley 809 off Symphony Road in the Fenway neighborhood. Neighbors said the rat problem is so bad that they can’t park their cars in the spots they own. But inspectors said getting rid of rats is an uphill battle. Commissioner Christopher pointed to all of the pizza boxes and trash left in flimsy plastic garbage bags on the ground. The city fights landlords that don’t plug holes in foundations or properly seal the bottoms of doors. Many landlords or residents don’t have enough trash barrels or at least not enough that are rodent-proof. The city slaps the owner of one Gainsborough Street building that backs up into Public Alley 809 with violations nearly twice a month — thousands in fines. “A lot of people see that as the cost of doing business,” Christopher said. We went to see the building manager, Mohsen Minaie. He said he just brought in exterminators, but he can’t stop the tide of trash that people leave in the alley. Since 2008, his company has received 73 trash or rodent violations. “Not my fault at all,” he said. As the city expands — more people equals more food equals more rats. Business has never better for private exterminators like Ultra Safe Pest Management. Exterminator Vic Palermo showed us what they’re up against as he worked on a building in Southie recently. He and his crew bait traps and stuff holes with rat-resistant mesh. They then seal it with concrete and set bait traps to lure them away from the building. The crew also advises building management on simple solutions to reduce the rat population, like moving the buffet — the dumpsters — away from the building. “They wouldn’t feel safe crossing the parking lot getting to the dumpsters and getting back,” Palermo said. The city said it doesn’t see the problem going away anytime soon. The city has had some success killing rats with dry ice — frozen carbon dioxide. It doesn’t leave a mess, won’t be accidentally eaten by other animals and is environmentally friendly. The EPA had ordered them to stop using it because it isn’t a registered pesticide, but the city said the agency is now showing signs of easing up on that restriction.